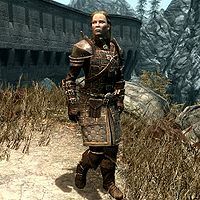 Vori is a Nord bandit and a member of the Dawnguard. She turns up in Dayspring Canyon at the beginning of the quest Bloodline. Vori never sleeps and spends all of her time patrolling the courtyard outside the entrance to Fort Dawnguard, preferably in the area near the refugee camp. At 10am and again at 2pm she pulls out her crossbow for two hours of target practice on the tree at the foot of the northwestern watchtower. At all other times she will march back and forth, although she will allow herself to eat or relax in the afternoon. She is clad in a set of Dawnguard heavy equipment. This includes the cuirass, matching pairs of gauntlets and boots, as well as a shield. She is equipped with a Dawnguard warhammer and a crossbow supplemented with 15 steel bolts. She carries a torch and a 25% chance of carrying 1-9 gold. She shares her dialogue with Mogrul, Tilde, and Ollrod, randomly saying: "Got to keep alert. We don't want to get caught napping like the Vigilants did. ", "I don't think the vampires would be stupid enough to attack us here, but you never know. ", "I'm glad we're finally taking the fight to those monsters. ", "I hope the vampires try to attack us here. A lot easier than hunting them down in their holes. ", "Isran knows how to fight those monsters. He's been preparing for this day for a long time. ", or "Now that the Dawnguard are back, the vampires' reign of terror is about to end." A female Nord named Vori appears in Morrowind. Esta página foi modificada pela última vez à(s) 20h08min de 14 de janeiro de 2014.